I'm a bit sad today. Just a couple of hours ago, my mom and I dropped off my family member, Tereza, at the airport. After staying with my mom for two and a half weeks, Tereza's first trip to the West Coast/California is over, and she's heading back to Prague. Growing up, I always wanted to have girl (first) cousins - I only have four cousins (4 on my mom's side, 0 on my dad's), and they are all boys. Don't get me wrong, I love them all, but I just always wished to have the relationship that my friends had with their girl cousins: not so much a sister, but more like a best friend. Hanging out with Tereza, who is technically my fourth cousin, for the past couple of weeks has been honestly so much fun. She is so sweet, so smart (her English is probably better than mine), and has the greatest sense of humor. I introduced her to margaritas, the film It Follows, s'mores, reality television (all of which she LOVED), as well as other random American things. She and I could talk for hours on end about anything and nothing, and still just genuinely enjoy each other's company. I am going to seriously miss this relationship that I've built with her, and I cannot wait until I visit her again in Prague, hopefully soon. So the recipe that I am bringing you today is one that has been in my and Tereza's family for over 75 years: palacinky. A very well-known dish throughout Central and Eastern Europe with different names depending on which country you are in, palacinky is something that not only I grew up eating, but my mother and her parents did as well. Like I've mentioned before, my mom's side of the family is fully Czech (both of my grandparents emigrated to the States in the 1950s) and with them, they brought a handful of dishes that I still crave and eat today (Řízek and goulash being my two favorites). Palacinky, a crêpe-like dish that can be eaten at any time of day, is one of the recipes that my grandma and grandpa would make for me when I was little. But after they passed away when I was fairly young, I didn't even think about making them for myself until this past weekend when my aunt decided to make them for a dinner party we were attending. Tasting them again after all these years brought back a flood of memories, and so I immediately asked for the recipe and had my aunt show me how to make them (spoiler alert: it's super easy). A big part of palacinky is the filling that you choose, which is traditionally some type of preserve or jam. I personally chose strawberry and apricot preserves that I found at my local Trader Joe's, and I also made some with Nutella which were insanely delicious. For the topping, it is common for palacinky to be sprinkled with powdered sugar, but I also made fresh whipped cream which I thought was a great addition. My aunt actually made her own preserves (nectarine and mixed berry) when she made the dish, so feel free to do this yourself with any fruit that is in season. If you wish to go the savory route which isn't as popular but still an option, just eliminate the sugar, vanilla extract, and lemon zest from the recipe. Then, you can fill it with whatever ingredients you'd like: ham, mushrooms, spinach, etc. Treat it as if you were choosing your favorite ingredients for an omelette. I want to add that my mom mentioned how growing up they would eat palacinky (the sweet way with jams and powdered sugar) for dinner, and this just makes me more proud to be Czech than ever before (who doesn't like eating sweets for dinner). Unlike crêpes, I feel like palacinky are much more forgiving: they aren't as thin as crêpes so flipping them in the pan is much easier, and if you tear a piece of the palacinky or brown a side too much, it can easily be covered up with toppings (whipped cream, powdered sugar, etc.). A trick that my aunt taught me in making palacinky is to preheat your nonstick pan on medium heat for about 3-5 minutes. 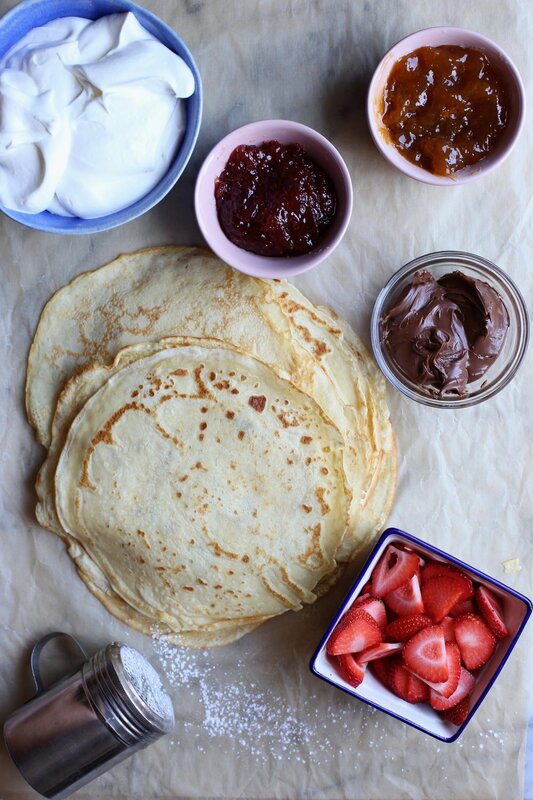 This ensures that even your first crêpe will come out perfectly (this is also a useful tip for making pancakes, another scenario where the first batch is usually a 'throwaway'). In a blender, mix all ingredients (eggs, sugar, melted butter, milk, vanilla, lemon zest) except for the flour. Add in the flour, in 1/2 cup increments, and blend until smooth. Let the batter sit for about 15 minutes. After this time, check the consistency of the batter: you are looking for a consistency similar to heavy cream - not thick like pancake batter, and not too runny. If it's too thick, add a splash of milk and mix. If it's too runny, add more flour, a tablespoon or two at a time, and mix. (Note: I followed the recipe as written, and the consistency was good enough for me to not add anything, in case you're worried). Preheat a nonstick pan or skillet for about 5 minutes on medium heat. Using a basting brush, spread a layer of the additional melted butter over the pan. Ladle some batter into the bottom of the pan, while twirling the pan, making sure that the batter spreads evenly. How much batter you add at a time is up to the size of your pan, but it will be between 1/4 cup to 1/3 cup per crêpe. Let it cook for about 2-3 minutes, or until the edges begin to turn golden brown. Using a thin spatula, flip the crêpe and cook the other side for about 2 minutes more. Continue steps 4 and 5 until all batter is used up (brush the pan with butter before each new addition of batter - trust me, it makes it taste much better!). Spread your desired filling on one side of the crêpe, leaving about 1 inch of a border, then simply roll it up. Sprinkle with powdered sugar, and top with whipped cream and/or fresh fruit, if desired. Palacinky can be stored in the refrigerator and/or freezer, just allow them to defrost and heat them up in the microwave before adding the filling. Enjoy!